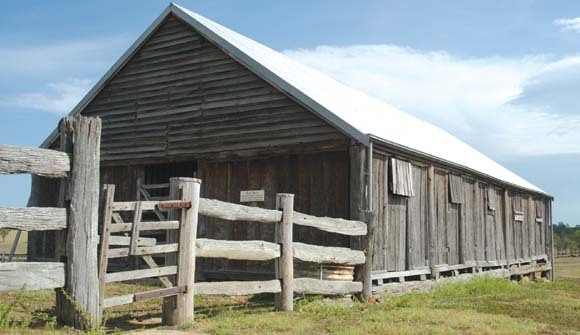 Tocal’s unique bull barn housed the best of the Reynolds’ famous Hereford stud bulls. The bulls were hand-fed and completely pampered. They exercised during the day and rested at night in their own stall. The Royal Easter Show in Sydney was the annual highlight for the Reynolds and Kidd families. The bulls were prepared for the show throughout summer and autumn by grooming and training them to lead. When show time came, they were loaded onto drays and taken to Paterson where they would board a train for Sydney. On arrival in Sydney they were walked from Central railway station through the city streets to the Showground in Moore Park. After the Royal Easter Show, people came to purchase the magnificent breeding stock. Lower ranking bulls were run in the paddocks towards the back of the property. Buyers came from as far away as Queensland and some would walk their bull home.